The native data types we have introduced so far --- numbers, Booleans, tuples, ranges, and strings --- are all types of immutable objects. While names may change bindings to different values in the environment during the course of execution, the values themselves do not change. In this section, we will introduce a collection of mutable data types. Mutable objects can change throughout the execution of a program. Our first example of a mutable object will be a function that has local state. That state will change during the course of execution of a program. Observe that the expression withdraw(25), evaluated twice, yields different values. This is a new kind of behavior for a user-defined function: it is non-pure. Calling the function not only returns a value, but also has the side effect of changing the function in some way, so that the next call with the same argument will return a different result. All of our user-defined functions so far have been pure functions, unless they called a non-pure built-in function. They have remained pure because they have not been allowed to make any changes outside of their local environment frame! We can visualize these changes with environment diagrams. The following environment diagrams illustrate the effects of each call, starting with the definition above. We abbreviate away code in the function values and expression trees that isn&apos;t central to our discussion. Our definition statement has the usual effect: it creates a new user-defined function and binds the name make_withdraw to that function in the global frame. 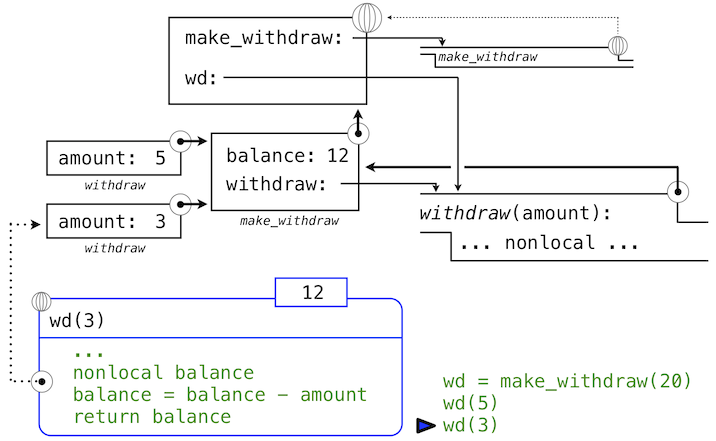 Next, we call make_withdraw with an initial balance argument of 20. This assignment statement binds the name wd to the returned function in the global frame. The returned function, (intrinsically) called withdraw, is associated with the local environment for the make_withdraw invocation in which it was defined. The name balance is bound in this local environment. Crucially, there will only be this single binding for the name balance throughout the rest of this example. Next, we evaluate an expression that calls withdraw on an amount 5. The name wd is bound to the withdraw function, so the body of withdraw is evaluated in a new environment that extends the environment in which withdraw was defined. Tracing the effect of evaluating withdraw illustrates the effect of a nonlocal statement in Python. The assignment statement in withdraw would normally create a new binding for balance in withdraw&apos;s local frame. Instead, because of the nonlocal statement, the assignment finds the first frame in which balance was already defined, and it rebinds the name in that frame. If balance had not previously been bound to a value, then the nonlocal statement would have given an error. By virtue of changing the binding for balance, we have changed the withdraw function as well. The next time withdraw is called, the name balance will evaluate to 15 instead of 20.
we see that the changes to the value bound to the name balance are cumulative across the two calls. Here, the second call to withdraw did create a second local frame, as usual. However, both withdraw frames extend the environment for make_withdraw, which contains the binding for balance. Hence, they share that particular name binding. Calling withdraw has the side effect of altering the environment that will be extended by future calls to withdraw. Practical guidance. By introducing nonlocal statements, we have created a dual role for assignment statements. Either they change local bindings, or they change nonlocal bindings. In fact, assignment statements already had a dual role: they either created new bindings or re-bound existing names. The many roles of Python assignment can obscure the effects of executing an assignment statement. It is up to you as a programmer to document your code clearly so that the effects of assignment can be understood by others. In particular, non-local assignment has given us the ability to maintain some state that is local to a function, but evolves over successive calls to that function. The balance associated with a particular withdraw function is shared among all calls to that function. However, the binding for balance associated with an instance of withdraw is inaccessible to the rest of the program. 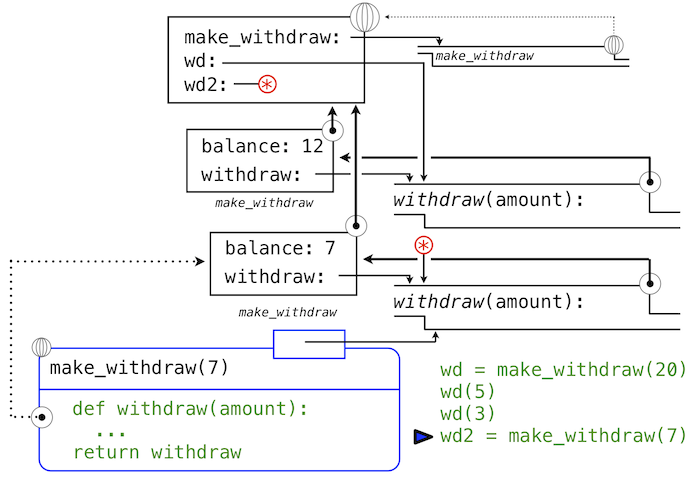 Only withdraw is associated with the frame for make_withdraw in which it was defined. 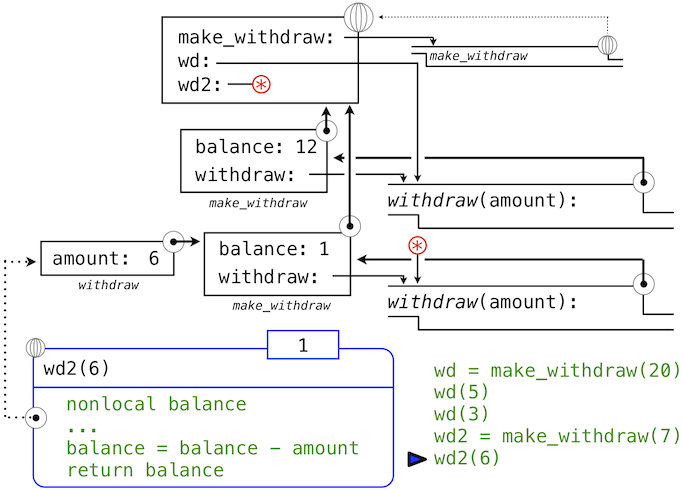 If make_withdraw is called again, then it will create a separate frame with a separate binding for balance. We can continue our example to illustrate this point. 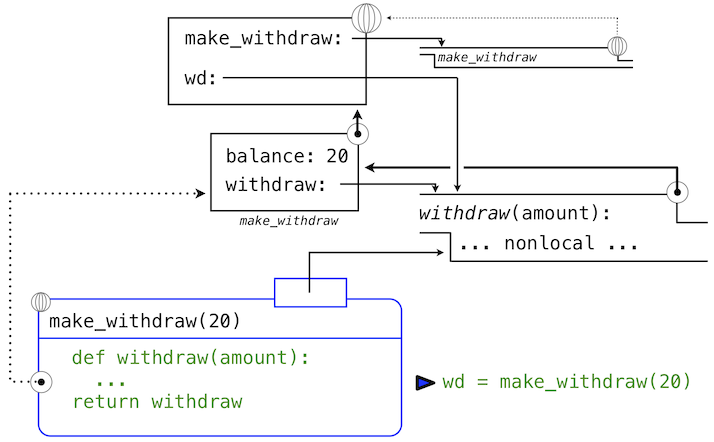 A second call to make_withdraw returns a second withdraw function that is associated with yet another environment. This second withdraw function is bound to the name wd2 in the global frame. We&apos;ve abbreviated the line that represents this binding with an asterisk. Now, we see that there are in fact two bindings for the name balance. 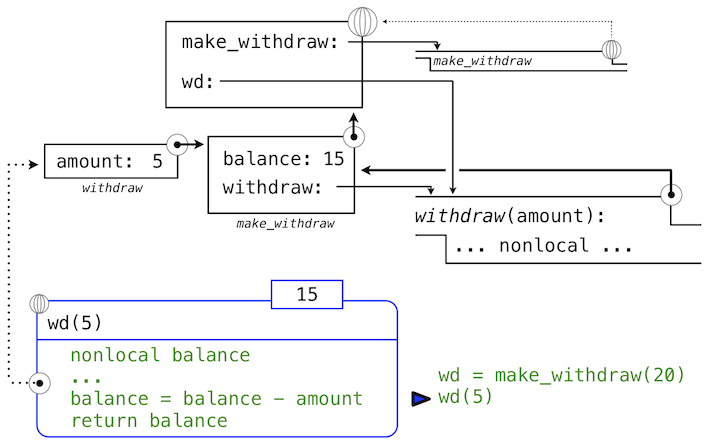 The name wd is still bound to a withdraw function with a balance of 12, while wd2 is bound to a new withdraw function with a balance of 7. This call changes the binding of its nonlocal balance name, but does not affect the first withdraw bound to the name wd in the global frame. 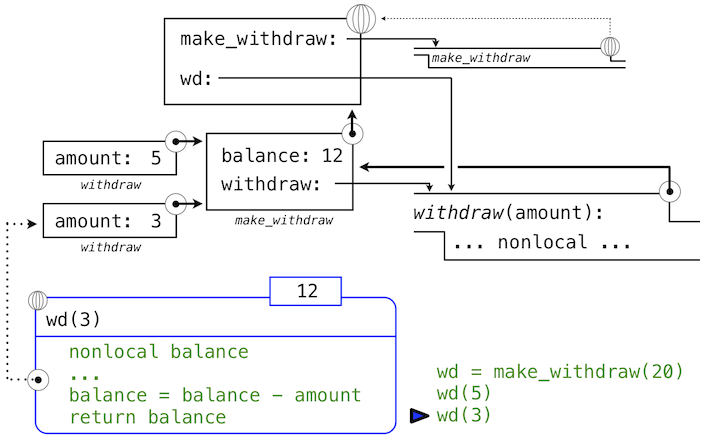 In this way, each instance of withdraw is maintaining its own balance state, but that state is inaccessible to any other function in the program. Viewing this situation at a higher level, we have created an abstraction of a bank account that manages its own internals but behaves in a way that models accounts in the world: it changes over time based on its own history of withdrawal requests. Previously, our values did not change; only our names and bindings changed. When two names a and b were both bound to the value 4, it did not matter whether they were bound to the same 4 or different 4&apos;s. As far as we could tell, there was only one 4 object that never changed. However, functions with state do not behave this way. When two names wd and wd2 are both bound to a withdraw function, it does matter whether they are bound to the same function or different instances of that function. Consider the following example, which contrasts the one we just analyzed. In this case, calling the function named by wd2 did change the value of the function named by wd, because both names refer to the same function. The environment diagram after these statements are executed shows this fact. Despite the complications it introduces, non-local assignment is a powerful tool for creating modular programs. Different parts of a program, which correspond to different environment frames, can evolve separately throughout program execution. Moreover, using functions with local state, we are able to implement mutable data types. In the remainder of this section, we introduce some of the most useful built-in data types in Python, along with methods for implementing those data types using functions with non-local assignment. The list is Python&apos;s most useful and flexible sequence type. A list is similar to a tuple, but it is mutable. Method calls and assignment statements can change the contents of a list. We can introduce many list editing operations through an example that illustrates the history of playing cards (drastically simplified). Comments in the examples describe the effect of each method invocation. Sharing and Identity. 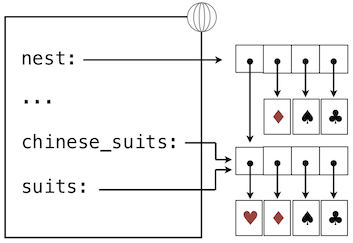 Because we have been changing a single list rather than creating new lists, the object bound to the name chinese_suits has also changed, because it is the same list object that was bound to suits. After this final assignment, we are left with the following environment, where lists are represented using box-and-pointer notation. As a result of this last invocation of the pop method, we return to the environment depicted above. Further reading. Dive Into Python 3 has a chapter on comprehensions that includes examples of how to navigate a computer&apos;s file system using Python. The chapter introduces the os module, which for instance can list the contents of directories. This material is not part of the course, but recommended for anyone who wants to increase his or her Python expertise. Implementation. Lists are sequences, like tuples. The Python language does not give us access to the implementation of lists, only to the sequence abstraction and the mutation methods we have introduced in this section. To overcome this language-enforced abstraction barrier, we can develop a functional implementation of lists, again using a recursive representation. This section also has a second purpose: to further our understanding of dispatch functions. Message passing. Given some time, we could implement the many useful mutation operations of Python lists, such as extend and insert. We would have a choice: we could implement them all as functions, which use the existing messages pop_first and push_first to make all changes. Alternatively, we could add additional elif clauses to the body of dispatch, each checking for a message (e.g., &apos;extend&apos;) and applying the appropriate change to contents directly. Dictionaries are Python&apos;s built-in data type for storing and manipulating correspondence relationships. A dictionary contains key-value pairs, where both the keys and values are objects. The purpose of a dictionary is to provide an abstraction for storing and retrieving values that are indexed not by consecutive integers, but by descriptive keys. Notice that &apos;L&apos; was not added to the end of the output above. Dictionaries are unordered collections of key-value pairs. When we print a dictionary, the keys and values are rendered in some order, but as users of the language we cannot predict what that order will be. This first restriction is tied to the underlying implementation of dictionaries in Python. The details of this implementation are not a topic of this course. Intuitively, consider that the key tells Python where to find that key-value pair in memory; if the key changes, the location of the pair may be lost. Implementation. We can implement an abstract data type that conforms to the dictionary abstraction as a list of records, each of which is a two-element list consisting of a key and the associated value. This implementation of a dictionary is not optimized for fast record lookup, because each response to the message &apos;getitem&apos; must iterate through the entire list of records. The built-in dictionary type is considerably more efficient. Using the Constraint System. To use the constraint system to carry out the temperature computation outlined above, we first create two named connectors, celsius and fahrenheit, by calling the make_connector constructor. Then, we link these connectors into a network that mirrors the figure above. The function make_converter assembles the various connectors and constraints in the network. We will use a message passing system to coordinate constraints and connectors. Instead of using functions to answer messages, we will use dictionaries. A dispatch dictionary will have string-valued keys that denote the messages it accepts. The values associated with those keys will be the responses to those messages. Constraints are dictionaries that do not hold local states themselves. Their responses to messages are non-pure functions that change the connectors that they constrain. One message we can send to a connector is to set its value. Here, we (the &apos;user&apos;) set the value of celsius to 25.
connector[&apos;set_val&apos;](source, value) indicates that the source is requesting the connector to set its current value to value. connector[&apos;has_val&apos;]() returns whether the connector already has a value. connector[&apos;val&apos;] is the current value of the connector. connector[&apos;forget&apos;](source) tells the connector that the source is requesting it to forget its value. connector[&apos;connect&apos;](source) tells the connector to participate in a new constraint, the source. constraint[&apos;new_val&apos;]() indicates that some connector that is connected to the constraint has a new value. constraint[&apos;forget&apos;]() indicates that some connector that is connected to the constraint has forgotten its value. The constraint&apos;s local function new_value is called whenever the constraint is informed that one of its connectors has a value. This function first checks to see if both a and b have values. If so, it tells c to set its value to the return value of function ab, which is add in the case of an adder. The constraint passes itself (constraint) as the source argument of the connector, which is the adder object. If a and b do not both have values, then the constraint checks a and c, and so on. The constructor make_connector has local functions for setting and forgetting values, which are the responses to messages from constraints. The local function set_value is called when there is a request to set the connector&apos;s value. If the connector does not currently have a value, it will set its value and remember as informant the source constraint that requested the value to be set. Then the connector will notify all of its participating constraints except the constraint that requested the value to be set. This is accomplished using the following iterative function.